Where’s the Love for Bud? 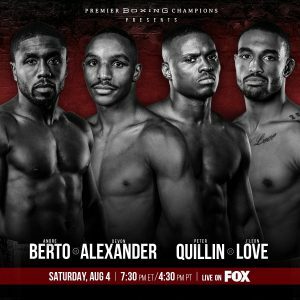 Terence Crawford 32-0 (23 KO’s) became the first male fighter since Bernard Hopkins to become the unified, undisputed champion of a weight division, capturing the WBA and IBF junior welterweight titles as he knocked out the undefeated Julius Indongo in three rounds. Crawford joined an exclusive list of undefeated, undisputed champions, a list featuring the likes of Mike Tyson, Muhammad Ali, Rocky Marciano, George Foreman, Jermain Taylor, Joe Frazier, Michael Spinks, Evander Holyfield and Cecelia Braekus. It should be noted Cecelia Braekus holds all four belts at 147 lbs. and defended her titles numerous times since 2014. Crawford already owned the WBO, WBC and Ring Magazine titles at 140 lbs., and his victory over Indongo further establishes Crawford as one of the best fighters in the sport; second only to the current unified, undefeated, light heavyweight champion Andre Ward 32-0 (16 KO’s). Speaking of pound-for-pound fighters, Crawford and Ward were disrespected by ESPN’s Teddy Atlas. During the post-fight interviews, Atlas discussed his top five pound-for-pound fighters and placed Vasyl Lomachenko 9-1 (7 KO’s) as his No.1 pound-for-pound fighter. Everyone is entitled to their opinion, but how did Errol Spence rise to No. 5? I also didn’t know Spence was Cuban. More importantly, no matter how spectacularly skilled one fighter is, how does so-called skilled fighter propel to the top position with only ten fights? With one of those fights (against Orlando Salido) resulting in defeat. Pound-for-pound rankings are supposed to be based on skills, performance, resume and accomplishments. It’s a collection of all four traits. How one interprets skill based on the eye test can be subjective. Performance, resume and accomplishments are based on the level of opposition one faces and Crawford and Ward have Lomachenko beat in those categories. Ward defeated Carl Froch, Arthur Abraham, Chad Dawson, Mikkel Kessler and Sergey Kovalev. At the time Ward defeated the aforementioned fighters, they were on the pound-for-pound lists and constants on the list. Crawford virtually defeated every top fighter/champion at lightweight and super lightweight. There is an argument from the Lomachenko contingent, stating it’s difficult to lure elite level fighters in the ring to face the Ukrainian star. It’s difficult to argue elite fighters lacking the desire to face Lomachenko when we do not know the particulars of the negotiation process. Even still his resume pales in comparison to Crawford or Ward. It’s not like there’s a pile of fighters, lining up to face Crawford or Ward either. It’s important to note the risk vs. reward factor. 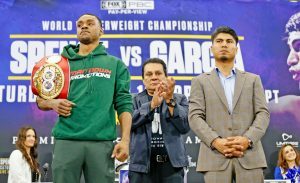 And of course we actually have a few guys taking aim at Lomachenko with Guillermo Rigondeaux and Mikey Garcia; two pound-for-pound level opponents who would certainly boost Lomachenko’s resume if he were to defeat them. 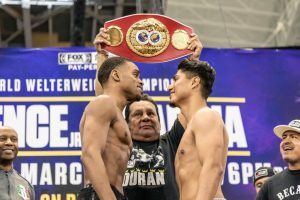 There is a contingent of observers, fans, writers, reporters, claiming to want toe-to-toe action inside the ring and watching the best fighters fight the best opposition available. Crawford just bested the only other super lightweight in contention and displayed how large the gap is between him and everyone else at 140 lbs. “Bud” also stopped the guy in three rounds. Prior to Indongo, Crawford mercilessly pummeled Felix Diaz across eleven rounds. Five of his last seven fights have not gone the distance. This is what we want and expect from our elite guys right? ESPN’s Bernardo Osuna threw a shot at Crawford immediately after his fight during the post-bout interview, suggesting the lack of importance of the sanctioning belts. Since when did the sanctioning bodies and titles not important? It can be argued the significance of the belts may have watered down a tad in this era of boxing, due to the politics of the sanctioning bodies, corrupt rankings, bribes, ridiculous sanctioning fees and the ability to label four or more champions per division because of the multiple and varying sanctioning bodies. However, championships still matter. Ask any competitor across any sport. How many undisputed champions are there in history? How many undefeated, undisputed champions are there in history? Is it a problem when unified middleweight champion Gennady Golovkin states he wants to chase and unify all of the belts? Crawford jumped up to junior welterweight in April of 2015 and in two years’ time already unified the division as the undisputed champ. In comparison, Golovkin held at least one version of the middleweight championship since 2010, but has yet to accomplish his goal of capturing all of the middleweight titles. Another glaring issue is the lack of promotion for Crawford. In a tweet since deleted from Crawford, he mentioned the lack of promotion for his fights and brand. “Glad everyone seen and notice the difference between how ESPN promoted my fight compared to the other two fights before me,” tweeted from Crawford Aug 22. He has a point. His stable mates Manny Pacquiao, Lomachenko, a few others appear to get promoted differently. For Pacquiao at this point his name precedes him, as he is already a well-established, if not a dwindling star. Recently retired Timothy Bradley dealt with the same issues as Crawford regarding the lack of promotion. The question is why? Crawford did what most so-called boxing fans want him to do, faced the best opponent available, knocked out his opponent in impressive fashion and called out the big names afterwards. He draws bigger crowds and has better viewership than some of his contemporaries on Top Rank as well. ESPN reported the Top Rank Boxing telecast of Terence Crawford-Julius Indongo drew the second-highest boxing match on cable television in 2017. Progressing forward, the goal for any fighter is to attain the biggest fights, earn greater pay days, collect more belts and potentially more fanfare. There are fans claiming to like a fighter because he is “down to earth” or “humble” right? It’s why many fans are attracted to fighters like Golovkin, Roman Gonzalez and others. Fans also enjoy the aspect of Golovkin and Gonzalez are action-friendly, knock-out seeking fighters. Gonzalez lost again and was knocked out in four rounds. Imagine the treatment Crawford would endure if the same happened to him. But why aren’t fighters like Crawford, or Bradley rewarded with the same fanfare and promotion? 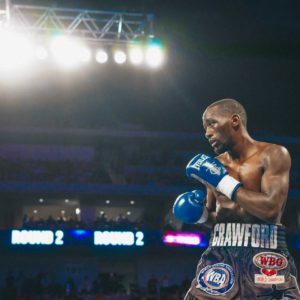 They are humble and in the case of Crawford, he aims for the knock-out while skillfully dissecting his opponents. The question to ask is, where is the promotion, where is the love?